Credit Rating for NCDs and FDs - What it Means? Credit Rating for NCDs and FDs – What it Means? We all are tempted to invest in bonds or fixed deposits offering highest interest rates, as we perceive them to be safe. But do you really know how safe they are? You can check the safety of your investment by looking at the Credit Ratings which give an idea on the likelihood of a default. There are four major rating agencies in India – CRISIL, ICRA, CARE and FITCH. Each of them has their proprietary ways of rating an instrument. 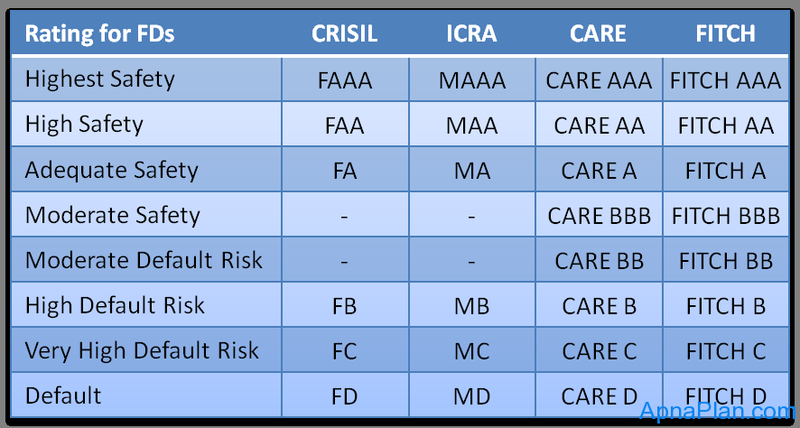 The tables below show the rating from each agency and what it means for the respective investment instrument. The rating scale for deposits and bonds range from ‘very high safety’ denoted by the symbol AAA to potential ‘default’ grade which is represented by a D symbol. 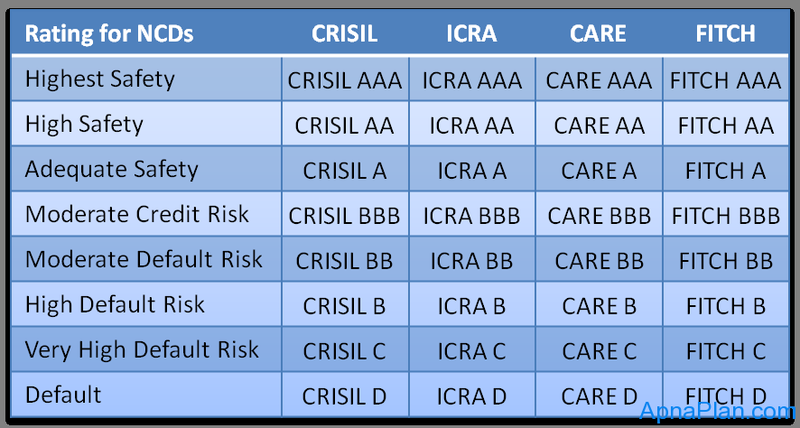 CRISIL, ICRA and CARE rated instruments with ratings lower than an A grade and FITCH rating below BBB are below investment grade. So you should never invest in Bonds or NCDs below this grade. In addition to the rating agencies also provide an outlook on the rating which indicates which way the rating would go in future. A negative outlook means the company would become more risky while positive outlook means the company risk is likely to improve in near future. The rating agencies evaluate various factors for assigning a rating. They may look at the risks inherent to the industry the company operates in, economic activity around the industry and so on. Then they also look at company specific factors like promoters track record of the company, their financials, share holding pattern, ability to tackle short term crisis among many other things.